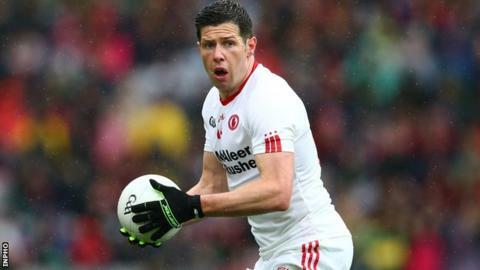 The return of captain Sean Cavanagh for his first Football League start of the season is one of five changes to the Tyrone team for Sunday's game at Laois. The former Footballer of the Year starts at full-forward in a Red Hand side seeking a third straight Division Two win in the O'Moore Park clash. Mickey O'Neill replaces Niall Morgan in goal, while Hugh Pat McGeary makes his first start at corner-back. Barry Tierney comes into the defence and Mark Bradley plays centre-forward. Cathal McCarron moves to full-back due to an injury which rules out Ronan McNamee and Tierney's inclusion sees Rory Brennan drop to the bench. Bradley's recall means that Mattie Donnelly switches to midfield, to the exclusion of Padraig McNulty. Connor McAliskey is the man to make way for Cavanagh in the attacking front line. Peter Harte is edging closer to a return from an ankle injury, and is included in the substitutes. Tyrone have seen off Cavan and Galway in their opening two fixtures to share top spot in the division with Ulster rivals Derry. Laois should go into Sunday's game with a degree of confidence after their away win over Armagh last time out. The O'Moore County look likely to be boosted for the game by the return of Brendan Quigley and Colm Begley after injury. Derry welcome back Brendan Rogers after injury as Damian Barton makes four changes from the win over Cavan for their game against Galway at Celtic Park on Sunday. Rogers has been out of action since sustaining a facial injury in the McKenna Cup final against Tyrone which needed 14 stitches. The Slaughtneil man's inclusion at midfield sees Mark Lynch moving to full-forward. With Daniel McKinless also drafted into attack, Christopher Bradley and Cailean O'Boyle drop out of the starting line-up. With Barton continuing to rotate the goalkeeping position, Emmet McNicholl returns between the posts in place of Thomas Mallon while Ryan Ferris replaces Ciaran Mullan in the full-back line. Derry boss Barton will have to watch the match from the stands after being handed a two-month ban for his part in the Dr McKenna Cup final on-field melee. Cavan, meanwhile, will face Meath at Navan on Sunday badly needing a win after their two narrow opening defeats by Tyrone and Derry. The Breffnimen played well during stages of both games but have still yet to earn a league point. Terry Hyland makes three changes from the defeat by Derry with Jason McLoughlin, Michael Argue and Seanie Johnston drafted into the starting line-up. Meath, who lost against Fermanagh last time out after their opening win over Armagh, make three changes with debutant Donnacha Tobin, Darragh Smyth and Eamon Wallace all drafted in. Meanwhile, Down boss Eamonn Burns makes six changes from their Division 1 game against Kerry at Newry on Sunday. Michael Cunningham replaces Stephen Kane in goals with Luke Howard and Darren O'Hagan drafted into the full-back line in place of Malachy Magee and Ryan Boyle. The other changes see Mark McKay, Conor Maginn and Barry O'Hagan taking over from Michael Hughes, Henry Brown and Shay McArdle but Donal O'Hare is not included despite being available again after suspension. The Pairc Esler game is a basement battle in Division 1 as both sides, along with Mayo, have yet to earn a league point this season. Down were hammered by Donegal in the opener four weeks ago before losing narrowly to Monaghan at Clones. The Farney men, meanwhile, welcome back Kieran Hughes for their game against All-Ireland champions Dublin at Croke Park on Saturday evening. Malachy O'Rourke makes two changes from the win over Down with Ryan Wylie and fit-again Kieran Hughes replacing Conor Boyle and Ryan McAnespie. The Dubs have won their opening two games against Kerry and Mayo. Donegal, who lead Division 1 on points difference, after their big wins over Down and Cork, face Mayo at Ballybofey on Sunday. Tyrone: M O'Neill, A McCrory, C McCarron, HP McGeary, T McCann, J McMahon, B Tierney, C Cavanagh, M Donnelly, N Sludden, M Bradley, C Meyler, D McCurry, S Cavanagh, R O'Neill. Derry: T Mallon; R Ferris, C McKaigue, K McKaigue; M Craig, G McKinless, D Heavron; Emmet Bradley, B Rogers; B Heron, J Kielt, C McFaul; R Bell, M Lynch, D McKinless. Cavan: R Galligan; P Faulkner, K Clarke, J McLoughlin; C Brady, C Moynagh, F Flanagan; T Corr, D Givney; D McVeety, G McKiernan, M Reilly; C Mackey, M Argue, S Johnston. Meath: P O'Rourke; D Keogan, C McGill, M Burke; B Power, P Harnan, D Smyth; H Rooney, D Tobin; S Tobin, C O'Sullivan, G Reilly; E Wallace, M Newman, D Lenihan. Down: M Cunningham; L Howard, G McGovern, D O'Hagan; C McGovern, A Carr, D O'Hanlon; P Turley, M McKay; J Murphy, M Poland, K McKernan; C Maginn, C Harrison, B O'Hagan. Monaghan: R Beggan; C Walshe, D Wylie, R Wylie; K Duffy, F Kelly, K O'Connell; N McAdam, D Hughes; S Carey, D Malone, T Kerr; O Duffy, K Hughes, C McManus. Subs: M Keogh, J McCarron, C Boyle, N McKeown, D Mone, P McKenna, R McAnespie, P Keenan, C McCarthy, B McGinn, D McKenna.